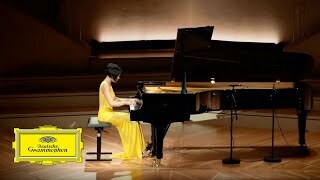 Yuja Wang's new album, The Berlin Recital, captures the white heat of solo works by Rachmaninov, Prokofiev, Scriabin and Ligeti, a trio of Russians together with one of the late 20th-century’s greatest composers. Watch a new video of Rachmaninov's Prelude in G Minor, Op. 23, No. 5 recorded live at the Berlin Philharmonic Hall.